Risperidone, sold under the brand name Risperdal among others, is an antipsychotic. It is used to treat schizophrenia, bipolar disorder, and irritability associated with autism. It is taken either by mouth or by injection into a muscle. The injectable version is long-acting and lasts for about two weeks. Common side effects include movement problems, sleepiness, dizziness, trouble seeing, constipation, and increased weight. Serious side effects may include the potentially permanent movement disorder tardive dyskinesia, as well as neuroleptic malignant syndrome, an increased risk of suicide, and high blood sugar levels. In older people with psychosis as a result of dementia, it may increase the risk of dying. It is unclear if it is safe for use in pregnancy. Risperidone is an atypical antipsychotic. Its mechanism of action is not entirely clear, but is believed to be related to its action as a dopamine antagonist and serotonin antagonist. Study of risperidone began in the late 1980s and it was approved for sale in the United States in 1993. It is on the World Health Organization's List of Essential Medicines, the most effective and safe medicines needed in a health system. It is available as a generic medication. The wholesale price in the developing world is between $US 0.01 and $US 0.60 per day as of 2014. The cost for a typical month of medication in the United States is between $US 100-200 as of 2015. In 2016, it was the 159th most prescribed medication in the United States, with more than 3 million prescriptions. 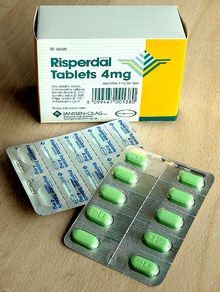 Risperidone is mainly used for the treatment of schizophrenia, bipolar disorder, and irritability associated with autism. Risperidone is effective in treating the acute exacerbations of schizophrenia. A 2013 study compared 15 antipsychotic drugs in treating schizophrenia. Risperidone was ranked fourth, 11% more effective than paliperidone (fifth), 20-23% more effective than haloperidol, quetiapine, and aripiprazole, and 36% less effective than clozapine (first). Risperidone seems to produce somewhat more extrapyramidal side effects and clearly more prolactin increase than most other atypical antipsychotics. It may also differ from other compounds in the occurrence of other adverse effects such as weight gain, metabolic problems, cardiac effects, sedation, and seizures. Nevertheless, the large proportion of participants leaving studies early and incomplete reporting of outcomes makes drawing firm conclusions difficult. Long-acting injectable formulations of antipsychotic drugs provide improved compliance with therapy and reduce relapse rates relative to oral formulations. The efficacy of risperidone long-acting injection appears to be similar to that of long acting injectable forms of first generation antipsychotics. Second-generation antipsychotics, including risperidone, are effective in the treatment of manic symptoms in acute manic or mixed exacerbations of bipolar disorder. In children and adolescents, risperidone may be more effective than lithium or divalproex, but has more metabolic side effects. As maintenance therapy, long-acting injectable risperidone is effective for the prevention of manic episodes but not depressive episodes. The long-acting injectable form of risperidone may be advantageous over long acting first generation antipsychotics, as it is better tolerated (fewer extrapyramidal effects) and because long acting injectable formulations of first generation antipsychotics may increase the risk of depression. Compared to placebo, risperidone treatment reduces certain problematic behaviors in autistic children, including aggression toward others, self-injury, temper tantrums, and rapid mood changes. The evidence for its efficacy appears to be greater than that for alternative pharmacological treatments. Weight gain is an important adverse effect. Some authors recommend limiting the use of risperidone and aripiprazole to those with the most challenging behavioral disturbances in order to minimize the risk of drug-induced adverse effects. Evidence for the efficacy of risperidone in autistic adolescents and young adults is less persuasive. Risperidone has shown promise in treating therapy-resistant obsessive–compulsive disorder, when serotonin reuptake inhibitors are not sufficient. Risperidone has not demonstrated a benefit in the treatment of eating disorders or personality disorders. While antipsychotic medications such as risperidone have a slight benefit in people with dementia, they have been linked to higher incidences of death and stroke. Because of this increased risk of death, treatment of dementia-related psychosis with risperidone is not FDA approved. Common side effects include movement problems, sleepiness, dizziness, trouble seeing, constipation, and increased weight. Serious side effects may include the potentially permanent movement disorder tardive dyskinesia, as well as neuroleptic malignant syndrome, an increased risk of suicide, and high blood sugar levels. In older people with psychosis as a result of dementia, it may increase the risk of dying. While atypical antipsychotics appear to have a lower rate of movement problems as compared to typical antipsychotics, risperidone has a high risk of movement problems among the atypicals. Atypical antipsychotics however are associated with a greater amount of weight gain. Carbamazepine and other enzyme inducers may reduce plasma levels of risperidone. If a person is taking both carbamazepine and risperidone, the dose of risperidone will likely need to be increased. The new dose should not be more than twice the patient's original dose. CYP2D6 inhibitors, such as SSRI medications, may increase plasma levels of risperidone. Since risperidone can cause hypotension, its use should be monitored closely when a patient is also taking antihypertensive medicines to avoid severe low blood pressure. The British National Formulary recommends a gradual withdrawal when discontinuing antipsychotic treatment to avoid acute withdrawal syndrome or rapid relapse. Some have argued the additional somatic and psychiatric symptoms associated with dopaminergic super-sensitivity, including dyskinesia and acute psychosis, are common features of withdrawal in individuals treated with neuroleptics. This has led some to suggest the withdrawal process might itself be schizomimetic, producing schizophrenia-like symptoms even in previously healthy patients, indicating a possible pharmacological origin of mental illness in a yet unknown percentage of patients currently and previously treated with antipsychotics. This question is unresolved, and remains a highly controversial issue among professionals in the medical and mental health communities, as well the public. Older people with dementia-related psychosis are at a higher risk of death if they take risperidone compared to those who do not. Most deaths are related to heart problems or infections. Risperidone has been classified as a "qualitatively atypical" antipsychotic agent with a relatively low incidence of extrapyramidal side effects (when given at low doses) that has more pronounced serotonin antagonism than dopamine antagonism. Risperidone contains the functional groups of benzisoxazole and piperidine as part of its molecular structure. Although not a butyrophenone, it was developed with the structures of benperidol and ketanserin as a basis. It has actions at several 5-HT (serotonin) receptor subtypes. These are 5-HT2C, linked to weight gain, 5-HT2A, linked to its antipsychotic action and relief of some of the extrapyramidal side effects experienced with the typical neuroleptics. It was recently found that D-amino acid oxidase, the enzyme that catalyses the breakdown of D-amino acids (e.g. D-alanine and D-serine — the neurotransmitters) is inhibited by risperidone. Dopamine receptors: This drug is an antagonist of the D1 (D1, and D5) as well as the D2 family (D2, D3 and D4) receptors, with 70-fold selectivity for the D2 family. This drug has "tight binding" properties, which means it has a long half-life and like other antipsychotics, risperidone blocks the mesolimbic pathway, the prefrontal cortex limbic pathway, and the tuberoinfundibular pathway in the central nervous system. Risperidone may induce extrapyramidal side effects, akathisia and tremors, associated with diminished dopaminergic activity in the striatum. It can also cause sexual side effects, galactorrhoea, infertility, gynecomastia and, with chronic use reduced bone mineral density leading to breaks, all of which are associated with increased prolactin secretion. Serotonin receptors: Its action at these receptors may be responsible for its lower extrapyramidal side effect liability (via the 5-HT2A/2C receptors) and improved negative symptom control compared to typical antipsychotics such as haloperidol for instance. Its antagonistic actions at the 5-HT2C receptor may account, in part, for its weight gain liability. Alpha α1 adrenergic receptors: This action accounts for its orthostatic hypotensive effects and perhaps some of the sedating effects of risperidone. Alpha α2 adrenergic receptors: Perhaps greater positive, negative, affective and cognitive symptom control. Histamine H1 receptors: effects on these receptors account for its sedation and reduction in vigilance. This may also lead to drowsiness and weight gain. Though this medication possesses similar effects to other typical and atypical antipsychotics, it does not possess an affinity for the muscarinic acetylcholine receptors. In many respects, this medication can be useful as an "acetylcholine release-promoter" similar to gastrointestinal drugs such as metoclopramide and cisapride. Risperidone undergoes hepatic metabolism and renal excretion. Lower doses are recommended for patients with severe liver and kidney disease. The active metabolite of risperidone, paliperidone, is also used as an antipsychotic. Risperidone was approved by the United States Food and Drug Administration (FDA) in 1993 for the treatment of schizophrenia. In 2003, the FDA approved risperidone for the short-term treatment of the mixed and manic states associated with bipolar disorder. In 2006, the FDA approved risperidone for the treatment of irritability in autistic children and adolescents. On August 22, 2007, risperidone was approved as the only drug agent available for treatment of schizophrenia in youths, ages 13–17; it was also approved that same day for treatment of bipolar disorder in youths and children, ages 10–17, joining lithium. The FDA's decision was based in part on a study of autistic people with severe and enduring problems of violent meltdowns, aggression, and self-injury; risperidone is not recommended for autistic people with mild aggression and explosive behavior without an enduring pattern. Janssen's patent on risperidone expired on December 29, 2003, opening the market for cheaper generic versions from other companies, and Janssen's exclusive marketing rights expired on June 29, 2004 (the result of a pediatric extension). It is available under many brand names worldwide. Risperidone is available as a tablet, an oral solution, and an ampule, which is a depot injection. On 11 April 2012, Johnson & Johnson (J&J) and its subsidiary Janssen Pharmaceuticals Inc. were fined $1.2 billion by Judge Timothy Davis Fox of the Sixth Division of the Sixth Judicial Circuit of the U.S. state of Arkansas. The jury found the companies had downplayed multiple risks associated with risperidone (Risperdal). The verdict was later reversed by the Arkansas State Supreme court. In August 2012, Johnson & Johnson agreed to pay $181 million to 36 U.S. states in order to settle claims that it had promoted risperidone and paliperidone for off-label uses including for dementia, anger management, and anxiety. In November 2013, J&J was fined $2.2 billion for illegally marketing risperidone for use in people with dementia. J&J has faced numerous civil lawsuits on behalf of children who were prescribed risperidone who grew breasts (a condition called gynecomastia); as of July 2016 there were about 1,500 cases in Pennsylvania state court in Philadelphia, and there had been a February 2015 verdict against J&J with $2.5 million awarded to a man from Alabama, a $1.75M verdict against J&J that November, and in 2016 a $70 million verdict against J&J. In 2015, Steven Brill posted a 15-part investigative journalism piece on J&J in Huffington Post, called "America's most admired lawbreaker", which was focused on J&J's marketing of risperidone. Brand names include Risperdal, Risperdal Consta, Risperdal M-Tab, Risperdal Quicklets, and Risperlet. ^ a b c d e f g h i j k l m n o p q r "Risperidone". The American Society of Health-System Pharmacists. Archived from the original on 2015-12-02. Retrieved Dec 1, 2015. ^ a b c d e Hamilton R (2015). Tarascon Pocket Pharmacopoeia 2015 Deluxe Lab-Coat Edition. Jones & Bartlett Learning. pp. 434–435. ISBN 9781284057560. ^ a b Hasnain M, Vieweg WV, Hollett B (July 2012). "Weight gain and glucose dysregulation with second-generation antipsychotics and antidepressants: a review for primary care physicians". Postgraduate Medicine. 124 (4): 154–67. doi:10.3810/pgm.2012.07.2577. PMID 22913904. ^ Schatzberg AF, Nemeroff CB (2009). The American Psychiatric Publishing textbook of psychopharmacology (4th ed.). Washington, D.C.: American Psychiatric Pub. p. 627. ISBN 9781585623099. ^ "Risperidone". International Drug Price Indicator Guide. Retrieved 2 December 2015. ^ "Respiridone". The American Society of Health-System Pharmacists. Archived from the original on 13 April 2011. Retrieved 3 April 2011. ^ a b Leucht S, Cipriani A, Spineli L, Mavridis D, Orey D, Richter F, Samara M, Barbui C, Engel RR, Geddes JR, Kissling W, Stapf MP, Lässig B, Salanti G, Davis JM (September 2013). "Comparative efficacy and tolerability of 15 antipsychotic drugs in schizophrenia: a multiple-treatments meta-analysis". Lancet. 382 (9896): 951–62. doi:10.1016/S0140-6736(13)60733-3. PMID 23810019. ^ Osser DN, Roudsari MJ, Manschreck T (2013). "The psychopharmacology algorithm project at the Harvard South Shore Program: an update on schizophrenia". Harvard Review of Psychiatry. 21 (1): 18–40. doi:10.1097/HRP.0b013e31827fd915. PMID 23656760. ^ Barry SJ, Gaughan TM, Hunter R (June 2012). "Schizophrenia". BMJ Clinical Evidence. 2012. PMC 3385413. PMID 23870705. ^ Glick ID, Correll CU, Altamura AC, Marder SR, Csernansky JG, Weiden PJ, Leucht S, Davis JM (December 2011). "Mid-term and long-term efficacy and effectiveness of antipsychotic medications for schizophrenia: a data-driven, personalized clinical approach". The Journal of Clinical Psychiatry. 72 (12): 1616–27. doi:10.4088/JCP.11r06927. PMID 22244023. ^ Rattehalli RD, Zhao S, Li BG, Jayaram MB, Xia J, Sampson S (December 2016). "Risperidone versus placebo for schizophrenia" (PDF). The Cochrane Database of Systematic Reviews. 12: CD006918. doi:10.1002/14651858.CD006918.pub3. PMID 27977041. ^ a b Komossa K, Rummel-Kluge C, Schwarz S, Schmid F, Hunger H, Kissling W, Leucht S (January 2011). "Risperidone versus other atypical antipsychotics for schizophrenia". The Cochrane Database of Systematic Reviews (1): CD006626. doi:10.1002/14651858.CD006626.pub2. PMC 4167865. PMID 21249678. ^ Leucht C, Heres S, Kane JM, Kissling W, Davis JM, Leucht S (April 2011). "Oral versus depot antipsychotic drugs for schizophrenia--a critical systematic review and meta-analysis of randomised long-term trials". Schizophrenia Research. 127 (1–3): 83–92. doi:10.1016/j.schres.2010.11.020. PMID 21257294. ^ Lafeuille MH, Dean J, Carter V, Duh MS, Fastenau J, Dirani R, Lefebvre P (August 2014). "Systematic review of long-acting injectables versus oral atypical antipsychotics on hospitalization in schizophrenia". Current Medical Research and Opinion. 30 (8): 1643–55. doi:10.1185/03007995.2014.915211. PMID 24730586. ^ Nielsen J, Jensen SO, Friis RB, Valentin JB, Correll CU (May 2015). "Comparative effectiveness of risperidone long-acting injectable vs first-generation antipsychotic long-acting injectables in schizophrenia: results from a nationwide, retrospective inception cohort study". Schizophrenia Bulletin. 41 (3): 627–36. doi:10.1093/schbul/sbu128. PMC 4393684. PMID 25180312. ^ Muralidharan K, Ali M, Silveira LE, Bond DJ, Fountoulakis KN, Lam RW, Yatham LN (September 2013). "Efficacy of second generation antipsychotics in treating acute mixed episodes in bipolar disorder: a meta-analysis of placebo-controlled trials". Journal of Affective Disorders. 150 (2): 408–14. doi:10.1016/j.jad.2013.04.032. PMID 23735211. ^ Nivoli AM, Murru A, Goikolea JM, Crespo JM, Montes JM, González-Pinto A, García-Portilla P, Bobes J, Sáiz-Ruiz J, Vieta E (October 2012). "New treatment guidelines for acute bipolar mania: a critical review". Journal of Affective Disorders. 140 (2): 125–41. doi:10.1016/j.jad.2011.10.015. PMID 22100133. ^ Yildiz A, Vieta E, Leucht S, Baldessarini RJ (January 2011). "Efficacy of antimanic treatments: meta-analysis of randomized, controlled trials". Neuropsychopharmacology. 36 (2): 375–89. doi:10.1038/npp.2010.192. PMC 3055677. PMID 20980991. ^ Peruzzolo TL, Tramontina S, Rohde LA, Zeni CP (2013). "Pharmacotherapy of bipolar disorder in children and adolescents: an update". Revista Brasileira de Psiquiatria. 35 (4): 393–405. doi:10.1590/1516-4446-2012-0999. PMID 24402215. ^ Gitlin M, Frye MA (May 2012). "Maintenance therapies in bipolar disorders". Bipolar Disorders. 14 Suppl 2: 51–65. doi:10.1111/j.1399-5618.2012.00992.x. PMID 22510036. ^ Gigante AD, Lafer B, Yatham LN (May 2012). "Long-acting injectable antipsychotics for the maintenance treatment of bipolar disorder". CNS Drugs. 26 (5): 403–20. doi:10.2165/11631310-000000000-00000. PMID 22494448. ^ Kirino E (2014). "Efficacy and tolerability of pharmacotherapy options for the treatment of irritability in autistic children". Clinical Medicine Insights. Pediatrics. 8: 17–30. doi:10.4137/CMPed.S8304. PMC 4051788. PMID 24932108. ^ "www.janssenpharmaceuticalsinc.com" (PDF). Archived (PDF) from the original on 2014-09-12. ^ Sharma A, Shaw SR (2012). "Efficacy of risperidone in managing maladaptive behaviors for children with autistic spectrum disorder: a meta-analysis". Journal of Pediatric Health Care. 26 (4): 291–9. doi:10.1016/j.pedhc.2011.02.008. PMID 22726714. ^ McPheeters ML, Warren Z, Sathe N, Bruzek JL, Krishnaswami S, Jerome RN, Veenstra-Vanderweele J (May 2011). "A systematic review of medical treatments for children with autism spectrum disorders". Pediatrics. 127 (5): e1312–21. doi:10.1542/peds.2011-0427. PMID 21464191. ^ Dove D, Warren Z, McPheeters ML, Taylor JL, Sathe NA, Veenstra-VanderWeele J (October 2012). "Medications for adolescents and young adults with autism spectrum disorders: a systematic review". Pediatrics. 130 (4): 717–26. doi:10.1542/peds.2012-0683. PMC 4074627. PMID 23008452. ^ Dold M, Aigner M, Lanzenberger R, Kasper S (April 2013). "Antipsychotic augmentation of serotonin reuptake inhibitors in treatment-resistant obsessive-compulsive disorder: a meta-analysis of double-blind, randomized, placebo-controlled trials". The International Journal of Neuropsychopharmacology. 16 (3): 557–74. doi:10.1017/S1461145712000740. PMC 4576518. PMID 22932229. ^ a b Maher AR, Theodore G (June 2012). "Summary of the comparative effectiveness review on off-label use of atypical antipsychotics". Journal of Managed Care Pharmacy. 18 (5 Suppl B): S1–20. doi:10.18553/jmcp.2012.18.s5-b.1. PMID 22784311. ^ a b "Risperdal Prescribing Information Label" (PDF). [email protected]: FDA Approved Drug Products. Jannsen Pharmaceuticals, Inc. Archived (PDF) from the original on 13 May 2014. Retrieved 17 April 2014. ^ Divac, N; Prostran, M; Jakovcevski, I; Cerovac, N (2014). "Second-generation antipsychotics and extrapyramidal adverse effects". BioMed Research International. 2014: 1–6. doi:10.1155/2014/656370. PMC 4065707. PMID 24995318. ^ BMJ Group, ed. (March 2009). "4.2.1". British National Formulary (57 ed.). United Kingdom: Royal Pharmaceutical Society of Great Britain. p. 192. ISSN 0260-535X. Withdrawal of antipsychotic drugs after long-term therapy should always be gradual and closely monitored to avoid the risk of acute withdrawal syndromes or rapid relapse. ^ Chouinard G, Jones BD (January 1980). "Neuroleptic-induced supersensitivity psychosis: clinical and pharmacologic characteristics". The American Journal of Psychiatry. 137 (1): 16–21. doi:10.1176/ajp.137.1.16. PMID 6101522. ^ Miller R, Chouinard G (November 1993). "Loss of striatal cholinergic neurons as a basis for tardive and L-dopa-induced dyskinesias, neuroleptic-induced supersensitivity psychosis and refractory schizophrenia". Biological Psychiatry. 34 (10): 713–38. doi:10.1016/0006-3223(93)90044-E. PMID 7904833. ^ Chouinard G, Jones BD, Annable L (November 1978). "Neuroleptic-induced supersensitivity psychosis". The American Journal of Psychiatry. 135 (11): 1409–10. doi:10.1176/ajp.135.11.1409. PMID 30291. ^ Seeman P, Weinshenker D, Quirion R, Srivastava LK, Bhardwaj SK, Grandy DK, Premont RT, Sotnikova TD, Boksa P, El-Ghundi M, O'dowd BF, George SR, Perreault ML, Männistö PT, Robinson S, Palmiter RD, Tallerico T (March 2005). "Dopamine supersensitivity correlates with D2High states, implying many paths to psychosis". Proceedings of the National Academy of Sciences of the United States of America. 102 (9): 3513–8. doi:10.1073/pnas.0409766102. PMC 548961. PMID 15716360. ^ Moncrieff J (July 2006). "Does antipsychotic withdrawal provoke psychosis? Review of the literature on rapid onset psychosis (supersensitivity psychosis) and withdrawal-related relapse". Acta Psychiatrica Scandinavica. 114 (1): 3–13. doi:10.1111/j.1600-0447.2006.00787.x. PMID 16774655. ^ Smith C, Rahman T, Toohey N, Mazurkiewicz J, Herrick-Davis K, Teitler M (October 2006). "Risperidone irreversibly binds to and inactivates the h5-HT7 serotonin receptor". Molecular Pharmacology. 70 (4): 1264–70. doi:10.1124/mol.106.024612. PMID 16870886. ^ a b c d Brunton L, Chabner B, Knollman B. Goodman and Gilman’s The Pharmacological Basis of Therapeutics, Twelfth Edition. McGraw Hill Professional; 2010. ^ Abou El-Magd RM, Park HK, Kawazoe T, Iwana S, Ono K, Chung SP, Miyano M, Yorita K, Sakai T, Fukui K (July 2010). "The effect of risperidone on D-amino acid oxidase activity as a hypothesis for a novel mechanism of action in the treatment of schizophrenia". Journal of Psychopharmacology. 24 (7): 1055–67. doi:10.1177/0269881109102644. PMID 19329549. ^ Hecht EM, Landy DC (February 2012). "Alpha-2 receptor antagonist add-on therapy in the treatment of schizophrenia; a meta-analysis". Schizophrenia Research. 134 (2–3): 202–6. doi:10.1016/j.schres.2011.11.030. PMID 22169246. ^ "The DrugBank database". Archived from the original on 2011-11-17. ^ "Electronic Orange Book". Food and Drug Administration. April 2007. Archived from the original on 2007-08-19. Retrieved 2007-05-24. ^ "FDA approves the first drug to treat irritability associated with autism, Risperdal" (Press release). FDA. October 6, 2006. Archived from the original on August 28, 2009. Retrieved 2009-08-14. ^ Scahill L (July 2008). "How do I decide whether or not to use medication for my child with autism? Should I try behavior therapy first?". Journal of Autism and Developmental Disorders. 38 (6): 1197–8. doi:10.1007/s10803-008-0573-7. PMID 18463973. ^ "Companies belittled risks of Risperdal, slapped with huge fine" Archived 2012-04-12 at the Wayback Machine, Los Angeles Times, 11 April 2012. ^ Thomas, Katie (2014-03-20). "Arkansas Court Reverses $1.2 Billion Judgment Against Johnson & Johnson - NYTimes.com". The New York Times. Archived from the original on 2015-11-05. ^ "NY AG: Janssen pays $181M over drug marketing". The Seattle Times. 30 August 2012. Archived from the original on 7 April 2016. ^ "Johnson & Johnson to Pay More Than $2.2 Billion to Resolve Criminal and Civil Investigations | OPA | Department of Justice". November 4, 2013. Archived from the original on March 5, 2015. ^ Feeley J (1 July 2016). "J&J Hit With $70 Million Risperdal Verdict Over Male Breasts". Bloomberg News. Archived from the original on 7 May 2017. ^ Ashbrook T (September 22, 2015). "Johnson & Johnson And The Big Lies Of Big Pharma". NPR's "On Point". Archived from the original on November 22, 2016. ^ Brill S (September 2015). "America's Most Admired Lawbreaker". The Huffington Post. Archived from the original on 2015-10-02. Wikimedia Commons has media related to Risperidone. PubChem Substance Summary: Risperidone—U.S. National Center for Biotechnology Information.